Last day of the desk clean-up. How is your desk? I’d love to see before and after pix if you are willing to share. Here is the worksheet if you haven’t gotten it yet. Today is desk drawers, spraying down your desktop, doing the last things, making a self-care basket and finally congratulating yourself and actually looking at your clean desk. 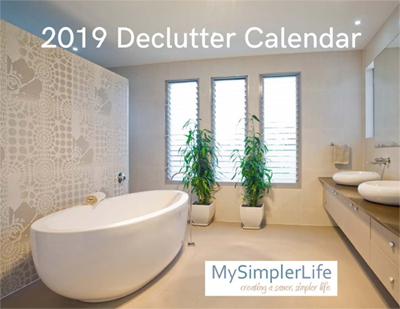 If you want to do more decluttering, join up with the Declutter Group starting Oct. 1. How is your desk looking? Did you miss some days? You can start again after Day 5. Today we are going through project files, cubbies and boxes and bulletin boars/whiteboards. 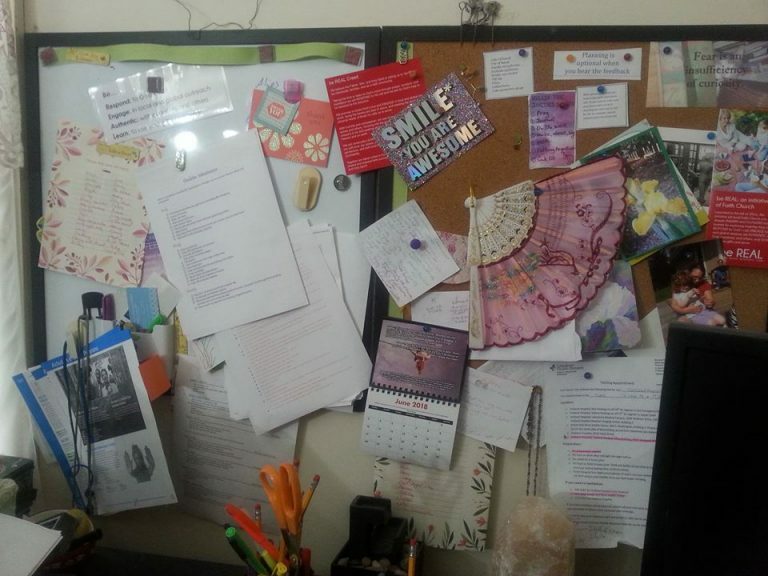 My Bulletin Board before and after. September 24 is National Innergize Day. This is a day to relax, reflect and rejuvenate yourself, focusing on your inner well-being. One way to innergize is to create and use a space for your relaxation. 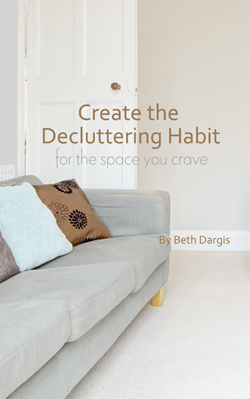 We’ve been talking about decluttering and one reason to declutter is to make room for nurturing spaces. Too much of our homes hold objects from the past or “what if I need this” futures. We need places for your current self to enjoy and be renewed. Find a Space. 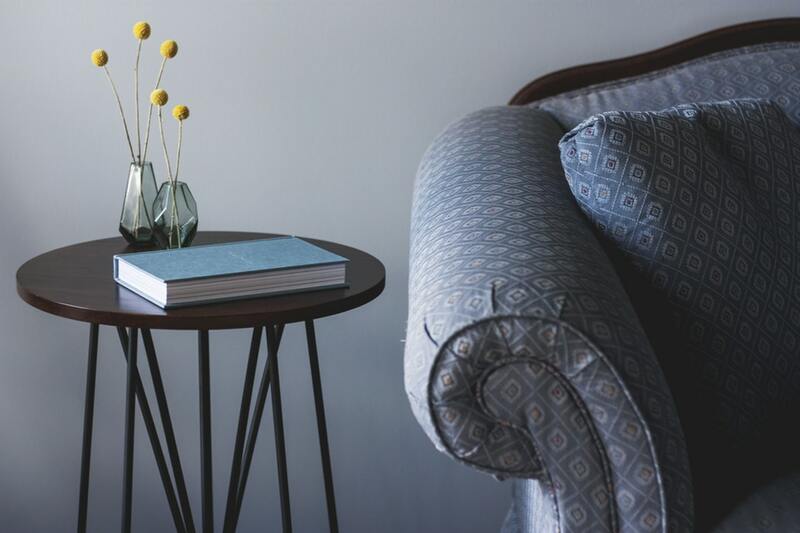 What area of your home tends to calm you or you can picture it calming you? It can be a corner, a room, an alcove, part of a guest bedroom, a closet, or even the bathroom. Declutter the area. Don’t know where to begin? Start at the doorway then keep going left as you declutter. Remove anything that doesn’t say relaxation to you. You want to keep objects that bring you peace. A more minimal room opens up space to create your cozy haven and allows your mind to relax more. Color. Do you have soothing colors here? Perhaps a peaceful blue, green, grey or lavender? What color for you signals that it is time to let go? You don’t have to re-paint if you don’t want to, but bring in some decorations, furniture or comforts in that color. Furniture. Creating a peaceful and nourishing environment to relax is important in relieving stress. Incorporate comfortable and supportive furnishings to help you unwind. Have a chair that is easy to read in for your favorite reading position. Perhaps a nice ottoman or foot stool. Do you have room for a couch? You might need storage solutions. Think about what you need to make this space support you. Natural, relaxing lighting. The blue light of most LED or fluorescent bulbs can agitate your system. So, try a full spectrum light bulb here. Sometimes you can enjoy sitting in candlelight, maybe with warm tea, so have candles nearby. Also, if you will be reading in the evening you can use Red Night Glasses to block out blue light and make it easier to transition to sleep. Decorations. Do you have any memorabilia, pictures or photos that make you feel good you would like to display? Perhaps a salt lamp has the ambient light you want. Include just a few soothing, happy decorations. You don’t want to re-clutter here. Music and white noise. Music settles the soul quicker than most things. So make sure you have a way to listen – a CD player, an iPod/iPhone speaker system, a vintage record player. How do you like to listen to music? You can also have soothing sounds from a white noise or nature sound machine/alarm system. I use Homedics White Noise Portable Sound Machine . There are many phone apps that have meditative music or nature sounds so you can take your restful place with you. You can create a relaxation playlist for when you are in your retreat place. Aromatherapy. Your sense of smell is primal and can have a powerful effect on how you feel about a space. Some of the most relaxing essential oil scents are chamomile, clary sage, lavender, rose and ylang ylang. You can use these scents in a variety of ways. I use a this portable diffuser . You can also use a carrier oil like jojoba oil and a few drops to massage into the skin. Before I got my diffuser I would put some drops of oil on cotton balls nearby. If your relax space is in the bathroom you can put 5 drops or so in your bath. You can use a spritzer to combine water and about 10 drops of oil. Keep a basket of your essential oil supplies in your area. Touch. We’ve talked about what we see, hear and smell in a relaxing space. How about what you touch? A cozy blanket. Warm slippers. Massage lotion to rub your feet. A Back Buddy or other massage tool. A foot bath. A yoga mat. Bring at least one thing into your space that nurtures your sense of touch. Nature. I adore walks in nature for reconnecting to the soul so I try to bring the natural world back into any relaxation space. It can be a window with bird feeders outside. Or a shelf of stones and shells. Flowers from the farmer’s market. Green plants. Pinecones from walks. Driftwood from the beach. Where can you add nature? Books. What are some of your favorite childhood books? Perhaps there are books with relaxation tips you own. Do you have a yoga book or a spiritual book that feels like coming home? Include a shelf of books, hide them in a pretty bag or have a couple stacked somewhere or in between fantastic bookends. Spiritual. Find space for whatever spiritual practice you have or want to have. Maybe a meditation cushion, prayer journal, mala beads, or a gratitude list. Creative. Some people like to relax with art. Do you have a table you can set up for coloring, watercolor painting, drawing, scrapbooking, etc.? 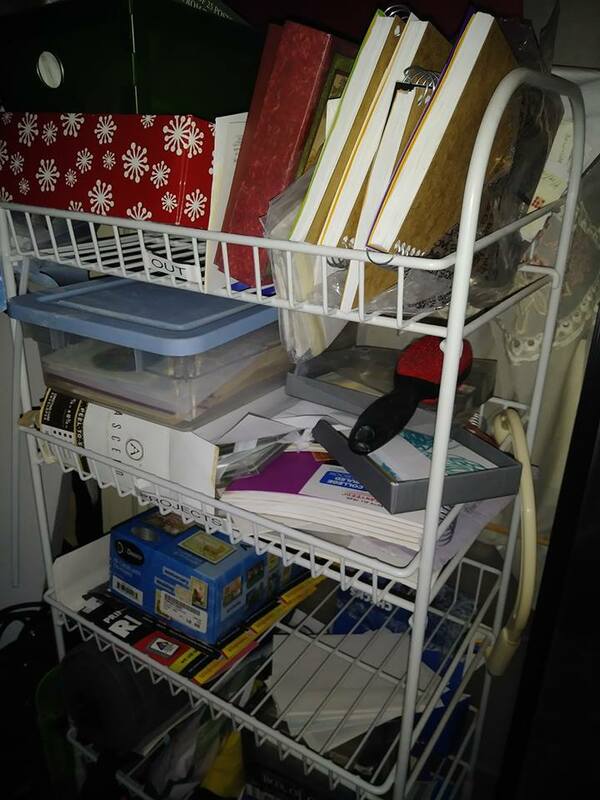 You can have a box or storage unit with a few supplies. 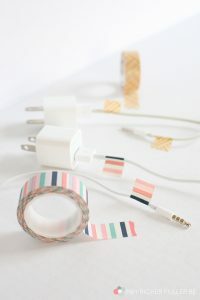 This isn’t necessarily a craft room which can be an overwhelming place. It’s a spot to dabble in your art if that calls to you. You don’t need to use all these suggestions. You will want to include what nurtures you in your space. It will also depend on how big an area you have. You don’t want an overwhelming, cluttered space. What one thing can you do today to create a cozy retreat place for you? Then schedule time to enjoy your haven. Welcome to Day 1 of the 5-Day Desk Clean Up…are you ready? I know desks are a big pain to keep clean. 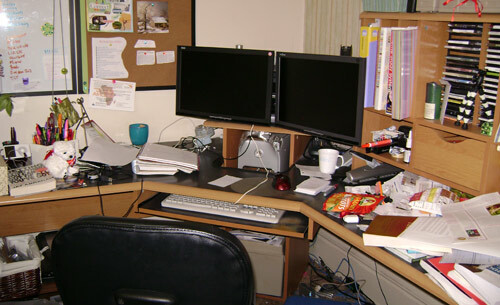 Yes, that is a before picture of my desk a couple years ago. But, it still gets that way sometimes. First, I want to say that you don’t have to have a clean and organized desk. If you work best in mess, than that is fine. Or you can clean up during this challenge, but not push yourself to perfectionism. I will never have a minimalist desk because I find them boring. 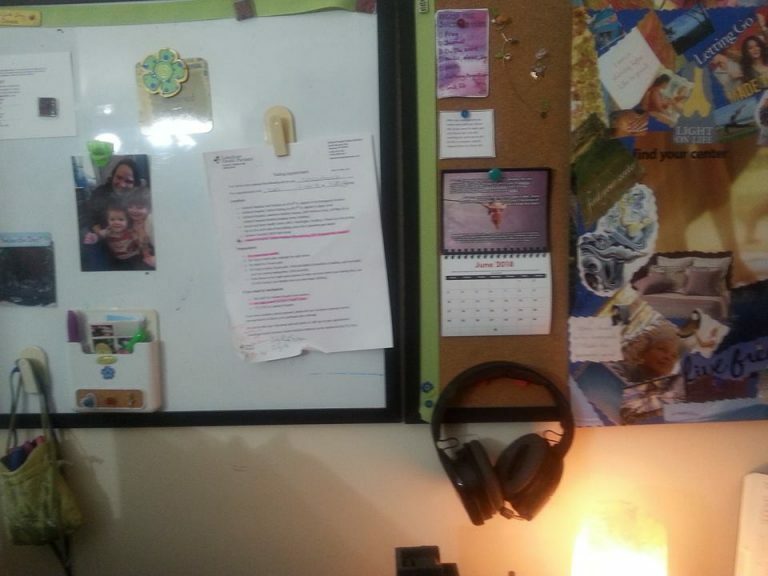 I like inspirational cork boards, salt lamps and a bunch of different colored pens. 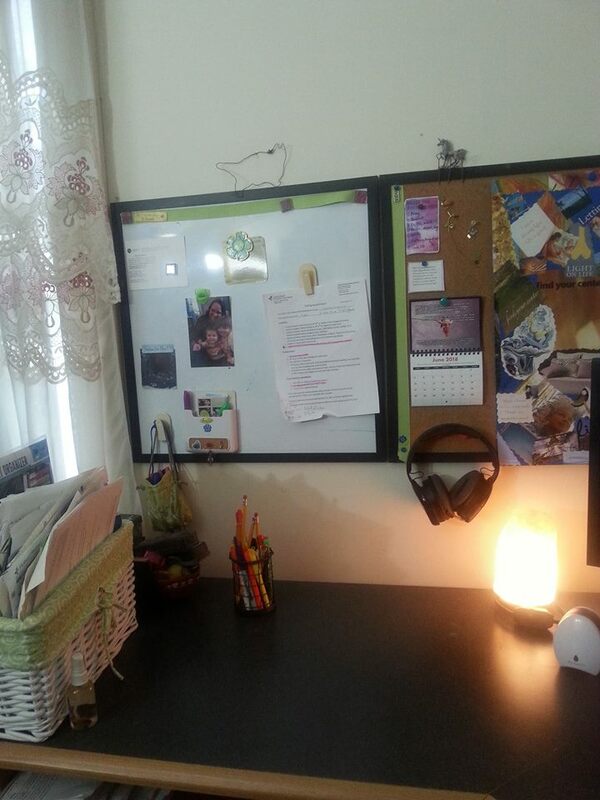 The only reason to declutter and organize your desk, is if it is hindering your work. 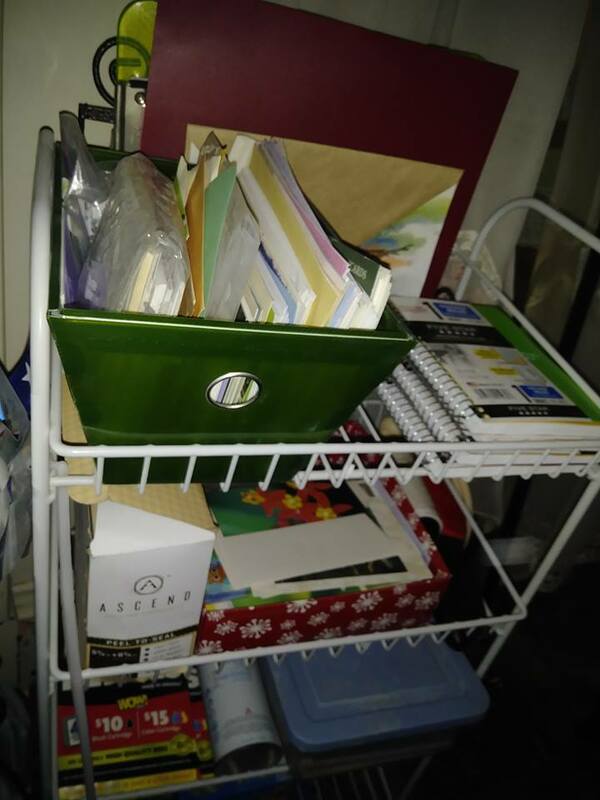 If you can’t find things, the space is making you feel heavy and claustrophobic, or papers are getting lost it may be time to take care of it. Here’s a fun playlist for while you work. Today we will be working on trash and books. When you are all done post here for accountability! I can’t wait to see your decluttered desks in 5 days! You are fantastic! I am a voracious reader and have been reading magazines since I was a child with my Nat Geo for kids. So when I found out I could get free magazines on my Kindle because I am an Amazon Prime member, I was giddy. No paper! 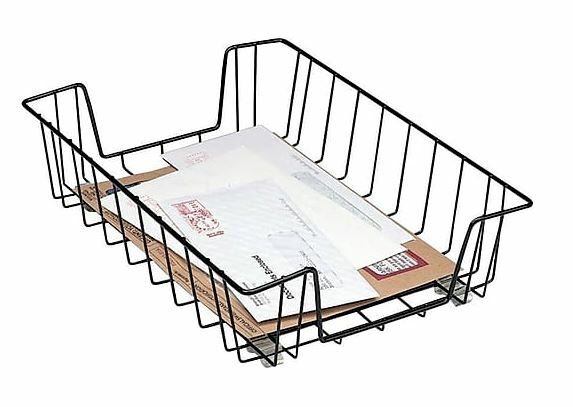 No clutter! Tons of information (see my Information Reduction Plan). I started reading magazines on cooking, health, women’s interest, fashion crafts and anything else that was out. I had canceled most of my paper magazines as I didn’t want the clutter. Currently I just have Reader’s Digest that my Grandma gets me and my husband & I enjoy. I would read magazines at night before bed or in downtime. Then I started noticing how they were making me feel. I was feeling not good enough about my weight, my home, my cooking. Each magazine included tons of projects that I didn’t have time to complete and that made me feel badly as well. 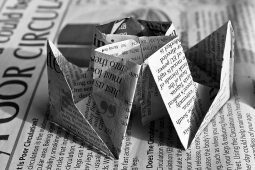 I wasn’t going to make that recipe, do that 30-day fitness challenge or make that paper craft. But, I felt I should. It’s interesting. I may even want to do it. But, I have lots of other things I want to do that weren’t dictated to me by a magazine. There was the time I was using the pick out a magazine to read and all the reading time for things I don’t intend to do. Plus, with all the advertisements I was enticed to buy things I didn’t need like expensive face cream or the latest home gadget. 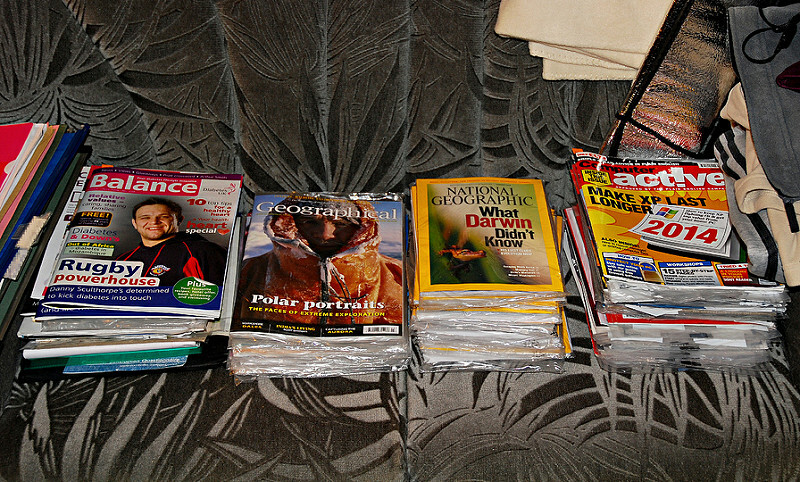 I decided no more magazines besides Reader’s Digest. I want to read things that are helpful and deep. I don’t need someone living on one of the coasts telling me what should be important to me.